Do you like when pieces just fit together and everything is tied and ordered? Do you do the same at your IT work? 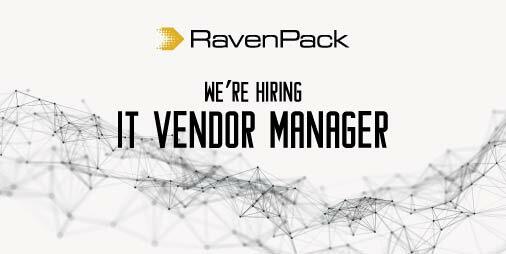 Join RavenPack in contributing to the growth and cutting-edge technology in big data. As our IT Vendor Manager, you will be reporting directly to the Director of IT Operations and will work with an international team of developers skilled in SQL, Python, Java, Common Lisp and Cloud technologies to ensure that all goals are accomplished in a cost-effective manner. The ability to communicate effectively in English and in Spanish, both in writing and verbally are a must. European Union legal working status is required. Competitive compensation and a fun working environment. Relocation assistance available, but working remotely is not possible for this position. You will be managing relationships with dozens of IT suppliers and providers, from AT&T to Amazon Web Services, going through local ISPs, IT providers, etc. Your main responsibility will be to help identify new vendors, to keep costs under control, and to mature those relationships for a satisfactory workflow. You will track down costs, make inventories, develop automation scripts, and be in charge of the providers' roster and renewals calendar. You will be part of the Operations Team, so a minimum SysAdmin experience is required. +2 years experience in a similar vendor or relationships role. +1 years of Linux SysAdmin experience. +1 years of AWS experience. English and in Spanish, both in writing and verbally are a must. Scripting skills in Bash, Python or similar. Experience in an troubleshooting On Call environment.